Former flat ride at Sea World. Originally operated in Birmingham, England as the Birmingham Eye. 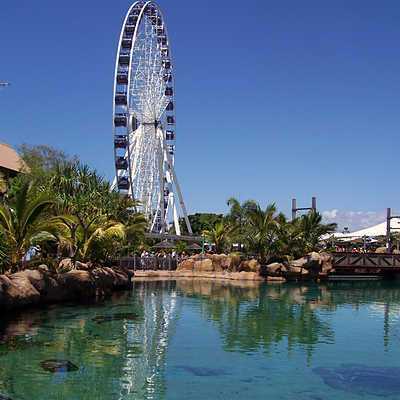 The organisation which owned and operated the attraction was purchased by an Australian company who set about dismantling the portable structure to bring it to Australia. It is was then leased by Sea World. Found on the land formerly occupied by the Thrillseeker roller coaster, and currently by Ray Reef. This land was originally earmarked for the construction of 'Seal Rocks', an attraction which never came to fruition. Each gondola is airconditioned and features an audio soundtrack about the surroundings. They are built by Swiss firm CWA Constructions, who also designed and manufactured the Sea World Monorail's trains. A single 'VIP' gondola was available for rent that gives riders the chance to ride in style with a plasma screen, DVD player and optional champagne.